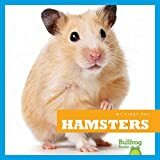 Hamsters are fun little creatures that can be the perfect first pet for both children and adults. If you’re interested in getting a hamster but feel you don’t know enough about them, fear not. I’m here to teach you the basics of owning a hamster and to steer you in the right direction. Of these five, the Syrian hamster – also called Golden hamster, Teddy Bear hamster, or Fancy hamster, is the most common one. Syrian hamsters are solitary and territorial by nature. They are calm and a little bit bigger than the other domesticated breeds, which make them easier to handle. Syrian hamsters live for up to 4 years. If you’re interested in owning a hamster, I would recommend you to start with a Syrian hamster. Before you run off to get a hamster, you need to make sure you are prepared and ready to take care of your furry friend beforehand. 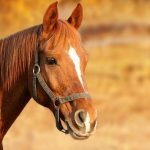 Finding the right cage can be a daunting task for the inexperienced owner, but it doesn’t have to be. Let me give you a quick and easy guide. Go with a wire cage with a plastic bottom because they are easy to clean, and provide the best ventilation. A wire cage is the best choice for Syrian hamsters. Buy the largest cage you have room for and can afford. More specifically, it’s the surface area that should be large, not the height. 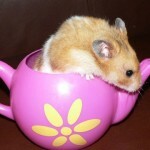 It will allow the hamster to move around and get plenty of exercise and stimulation. 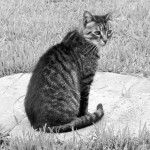 ASPCA believes 10 gallons to be the minimum size. Avoid tall cages, as hamsters are terrible at climbing down. They could fall and get seriously injured. Make sure to place the cage in a quiet room without drafts; this will help keep your pet calm and healthy. And remember, Syrians are solitary creatures. 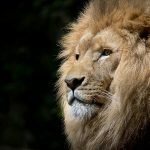 Do NOT keep more than one in the same cage! 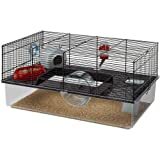 There are many different materials to choose from when it comes to hamster bedding. You should only pick one that is safe, clean, and natural. These three bedding materials all have their pros and cons, so don’t be afraid to try them out to see which one you and your hamster likes the most. Because they need a healthy and well-balanced diet, and it can be difficult for a beginner to know what foods to give. One option is to put together a diet of natural fresh foods. 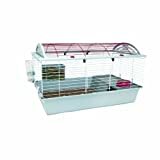 With the right knowledge and some work, that could provide your hamster with the right amounts of proteins, carbs, fat, vitamins, and minerals. 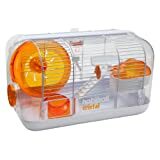 However, I think it’s much easier to go with prepackaged food that you can buy at any well-stocked pet shop, and that’s what I’d recommend for most owners since it should contain all the nutrients your hamster needs to be healthy and happy. Ask the staff at your local pet shop for help if you are not sure what food to buy. 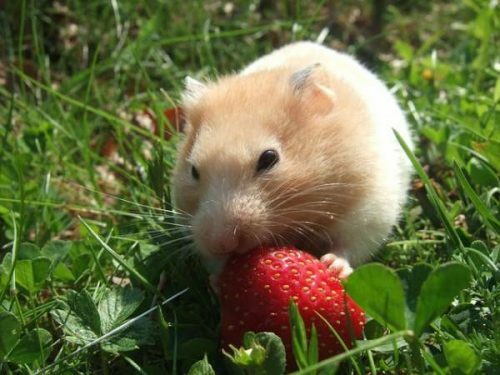 To supplement the regular diet, it’s also a good idea to give your hamster tasty treats from time to time. Slices of apples, strawberries, and grapes are all healthy choices, as long as you give them in moderation, and no more than twice a week. As a hamster’s teeth never stop growing, you need to provide your them with hard treats, like tree branches or dog biscuits, once a week. Gnawing on something hard will help keep the teeth in check. Now that you have a cage, bedding, and food, the last things you need to get are what I call the accessories. Fortunately, if you buy a quality cage, most of these items will already be included. 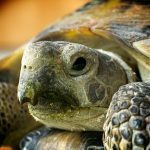 Smaller issues can quickly become serious health problems, and that’s why it’s important to keep an eye out for behavioral and physical changes in your hamster. If your hamster shows one or more of these symptoms, contact a veterinarian as soon as possible. 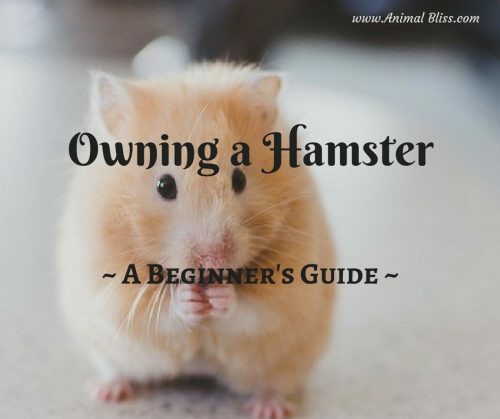 This beginner’s guide to owning a hamster was a long text packed with information and advice, and I hope I haven’t discouraged you from getting your first hamster. To round things off, I have saved perhaps the most important advice for last. 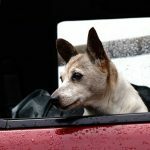 GUEST WRITER: John Solvik has had a deep love for animals from an early age. 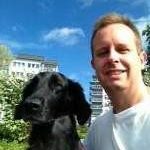 PetAnimalGuide.com is his way of helping pet owners take better care of their furry friends. Do you have a hamster, or are you thinking of getting one? 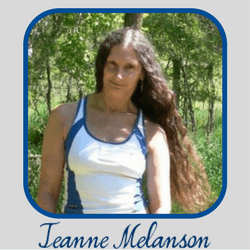 Thank you Jeanne for the opportunity to contribute! Thank YOU, John. All the best!